Fun – how much will a child enjoy the activity? Participants can make submissions throughout the year. Once they make a submission, they enter a Preliminary round where the submission is evaluated. Based on the evaluation, they could qualify to Regional or National finals. A participant can make 2 submissions in each Preliminary round. So, in a year, a participant can make up to 6 submissions (2 in each of the three rounds). Top submissions from each round get a direct entry to National Finals. Note: Numbers are for representational purpose only. Entries that do not qualify for National Finals, could still qualify for Regional Finals. Participants get another chance to qualify from Regional Finals to National Finals. 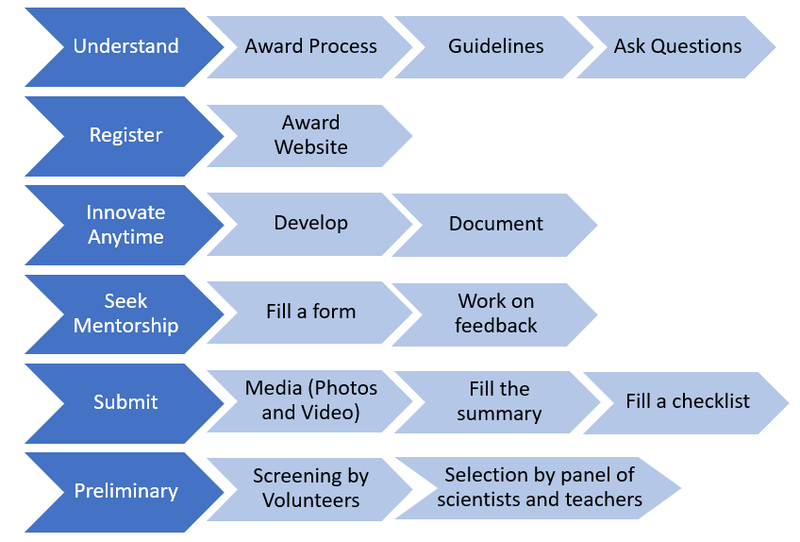 Example: Assume in Preliminary Stage – III, 2000 participants make submissions. Of these 18 could go to National Finals, while 120 might qualify for Regional Finals. We accept ideas for the Preliminary Stage all year round. Just proceed to submit your innovation after registering yourself. You can have multiple ideas and we would happy to review all of them. Refer to the Schedule section for details. Preliminary submission will be online. However, children who do not have access to the Internet will have the option of sending their entries by post to the address provided. A postal registration template can be downloaded from the Download page. The child can choose any topic that appears in the curriculum of III-X standard of any board. A child is allowed to submit up to 2 entries for the preliminary stage. After creation of their innovative activity, the participant has to document it and upload a photograph with a short description on the award web site. These entries will be screened by experts and qualified volunteers to select a winner and meritorious submissions for progression to the subsequent stages. Originality of the idea. If the idea is a variation of an existing idea, then provide link to existing idea. 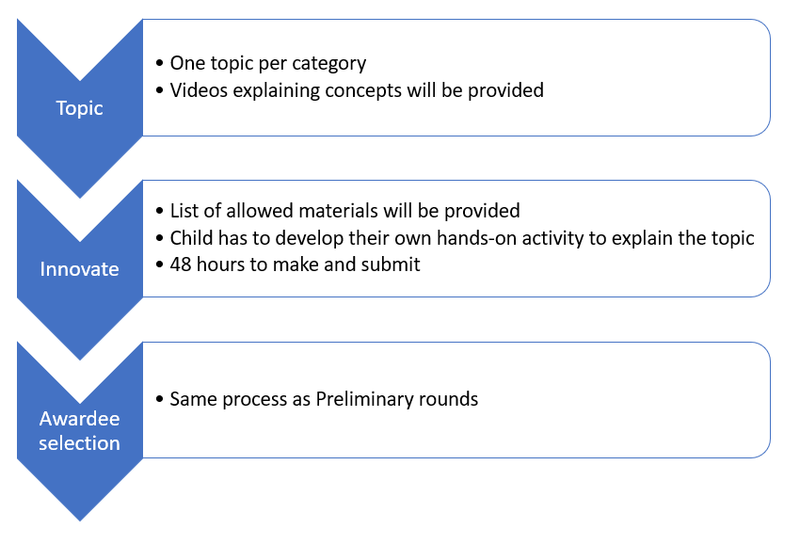 The submission should include a) Scientific Principle addressed b) Materials used c) Description of steps d) Description of Science and most importantly photos, illustration and / or video of the activity. There is no direct entry to Regional Finals. Participants entre regional finals based on their submission in any one of the Preliminary rounds I, II or III. Regional Finals will be an online event. The topic for regional finals will be announced and only one submission in the topic will be allowed. For the National Finals, approximately 100 selected finalists, split approximately evenly across the 3 categories, will contest a National Finals at Panchavati on 10th November 2019. 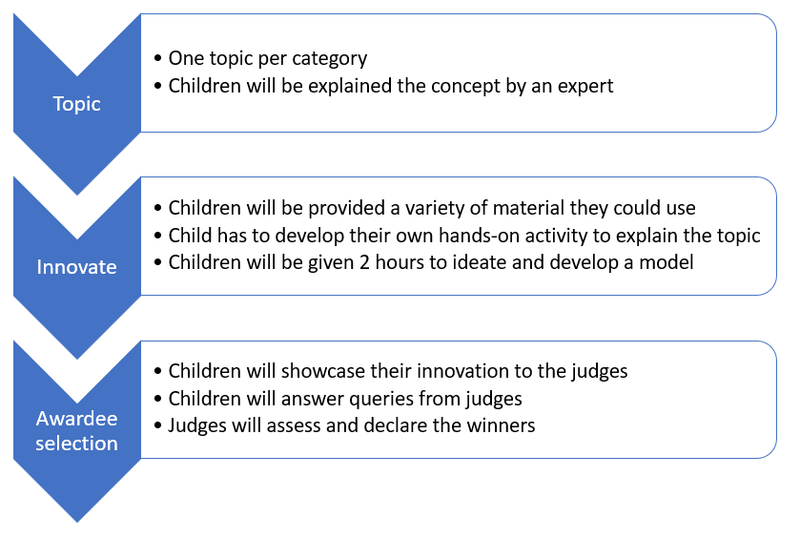 During the finals, one science topic will be chosen for each category and children will be briefed on the topic and provided access to selected resources and a range of materials. Finalists are expected to create their own innovations “on the fly”, and the best one, judged by our expert panel, will be declared the winner in each category. Watch this space for details of the National Finals. 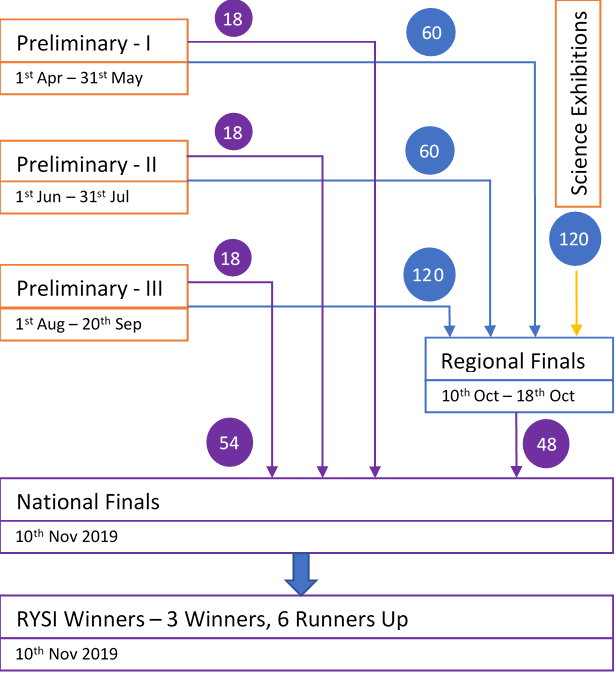 During the finals, both Regional and National Finals, one science topic will be chosen for each category and children will be briefed on the topic and provided access to selected resources and a range of materials. Finalists are expected to create their own innovations “on the fly”, and the best one, judged by our expert panel, will be declared the winner in each category.